Businessman, MLA (1888), MLA (1888-1892), MLA (1896-1899), MLA (1900-1903), MLA (1903-1907), MLA (1908-1910), MLA (1911-1914), MLA (1914-1915), Premier of Manitoba (1900-1915). Born at Sophiasburg, Prince Edward County, Ontario on 15 February 1853, son of James Platt Roblin and Deborah R. Roblin, he was educated at Albert College (Belleville, Ontario). He worked as a cheese buyer and in 1877 moved to Winnipeg. He then moved to Carman where he operated a general store from 1880 to 1886. He served as Reeve of the Rural Municipality of North Dufferin for three years, as well as a warden for two years, and a school trustee. He unsuccessfully contested Dufferin North for the provincial legislature in 1886. Elected at a March 1888 by-election, he was acclaimed as an Independent for Dufferin in the 1888 general election, and in 1892 he ran unsuccessfully as a Conservative for the Morden seat. In 1896 he was elected as Conservative member for Woodlands, re-elected in 1899, and he was soon chosen leader of the party. 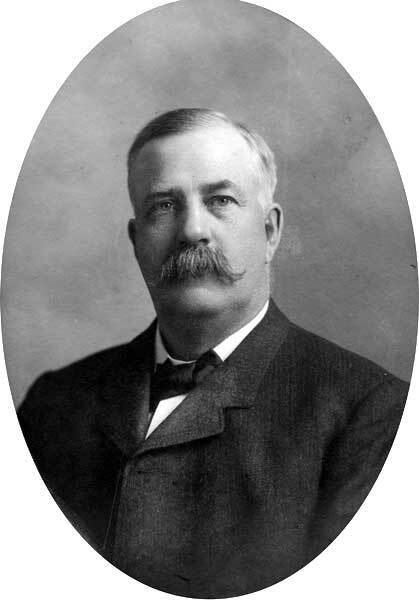 Roblin became Premier in October 1900, re-elected in 1903, 1907, 1910, and 1914, serving until his resignation in 1915 in the midst of a corruption scandal over the construction of the Manitoba Legislative Building. He promoted the grain trade and railway construction, and introduced the first government-owned telephone system in North America. Manitoba extended its boundary and doubled its territory in 1912 under his premiership. He was made knight commander of the Order of St. Michael and St. George in 1912. After leaving politics, he operated an automobile dealership. He was married twice, first on 13 September 1875 to Adelaide DeMille (1853-1928) with whom he had five sons: Frederick Roblin (c1876-? ), Wilfred Laurier Roblin (1878-? ), Arthur Beltram Roblin (1885-1954), George Aubrey Roblin, and Charles Dufferin Roblin (1892-? ; father of Dufferin Roblin). On 5 February 1929, after the death of his first wife, he married Ethel Leggett (?-?) at Los Angeles, California. He was a member of the Manitoba Club, Carleton Club, Adanac Club, and Hunt Club. He died at Hot Springs, Arkansas on 16 February 1937. He is commemorated by Roblin Boulevard in Winnipeg, the Town of Roblin, and the Rural Municipal of Roblin. There are papers at the Archives of Manitoba. Thirty-Five Years in the Limelight: Sir Rodmond P. Roblin and His Times by Hugh Robert Ross (1936). “Rodmond P. Roblin, 1900-1915 ” by Jim Blanchard in Manitoba Premiers of the 19th and 20th Centuries, edited by Barry Ferguson and Robert Wardhaugh, Canadian Plains Research Centre, 2010. 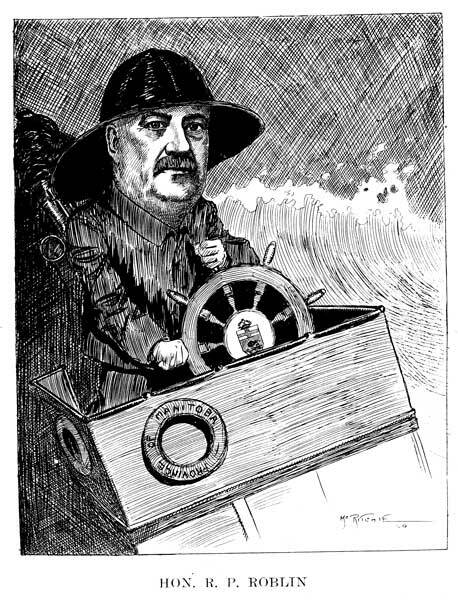 Sir Rodmond Palen Roblin by Jim Blanchard, Dictionary of Canadian Biography.